Artist's rendition of the Lunar Reconnaissance Orbiter (LRO) at the moon. The CRaTER telescope is seen pointing out at the bottom right center of the LRO spacecraft. Crewed missions to Mars remain an essential goal for NASA, but scientists are only now beginning to understand and characterise the radiation hazards that could make such ventures risky, concludes a new paper by University of New Hampshire (UNH) scientists. In a paper published online in the journal Space Weather, associate professor Nathan Schwadron of the UNH Institute for the Study of Earth, Oceans, and Space (EOS) and the department of physics says that due to a highly abnormal and extended lack of solar activity, the solar wind is exhibiting extremely low densities and magnetic field strengths, which causes dangerous levels of hazardous radiation to pervade the space environment. 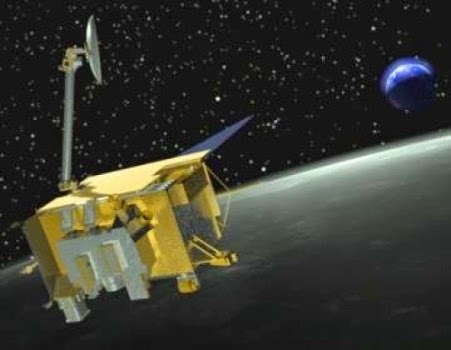 "The behaviour of the sun has recently changed and is now in a state not observed for almost 100 years," says Schwadron, lead author of the paper and principal investigator for the Cosmic Ray Telescope for the Effects of Radiation (CRaTER) on NASA's Lunar Reconnaissance Orbiter (LRO). He notes that throughout most of the space age, the sun's activity has shown a clockwork 11-year cycle, with approximately six- to eight-year lulls in activity (solar minimum) followed by two- to three-year periods when the sun is more active. "However, starting in about 2006, we observed the longest solar minimum and weakest solar activity observed in the space age." These conditions brought about the highest intensities of galactic cosmic rays seen since the beginning of the space age, which have created worsening radiation hazards that potentially threaten future deep-space astronaut missions. "While these conditions are not necessarily a showstopper for long-duration missions to the moon, an asteroid, or even Mars, galactic cosmic ray radiation in particular remains a significant and worsening factor that limits mission durations," says Schwadron. The study is the capstone article in the Space Weather CRaTER Special Issue, which provides comprehensive findings on space-based radiation as measured by the UNH-led detector. The data provide critical information on the radiation hazards that will be faced by astronauts on extended missions to deep space such as those to Mars. "These data are a fundamental reference for the radiation hazards in near Earth 'geospace' out to Mars and other regions of our sun's vast heliosphere," says Schwadron. At the heart of CRaTER is material called "tissue equivalent plastic," a stand-in for human muscle capable of gauging radiation dosage. Ionizing radiation from galactic cosmic rays and solar energetic particles remains a significant challenge to long-duration crewed missions to deep space. Human beings face a variety of consequences ranging from acute effects (radiation sickness) to long-term effects including cancer induction and damage to organs including the heart and brain. The high radiation levels seen during the sun's last minimum cycle limits the allowable days for typical astronauts behind spacecraft shielding. Given the trend of reducing solar output, the allowable days in space for astronauts is dropping and estimated to be 20 percent lower in the coming solar minimum cycle as compared to the last minimum cycle.